Ideal Indoor Climate - Holz100 Canada Inc. Temperature fluctuations: cold, uncomfortable wall surfaces and fluctuating air humidity values ​​are alien to the wooden house. As a resident of a Holz100 house, you will experience a thermal well-being that until now did not seem feasible in this constellation. Wood has an excellent heat storage capacity compared to other building materials and therefore cools only very slowly. The wooden house not only warms in winter, but stays pleasantly cool in summer. Summer heat penetrates just as slowly from outside to inside as heating heat from the inside to the outside. The Thoma Holz100 wall not only offers fantastic U-values, it also controls a lot more. For example, as a massive, monolithic, but above all vegetal building material, it has outstanding heat storage capacities twice as high as those of conventional mineral wall building materials. This results in particularly good cooling times, since the Holz100 wall combines very good U-values ​​and very good storage capacity values ​​in a unique way. 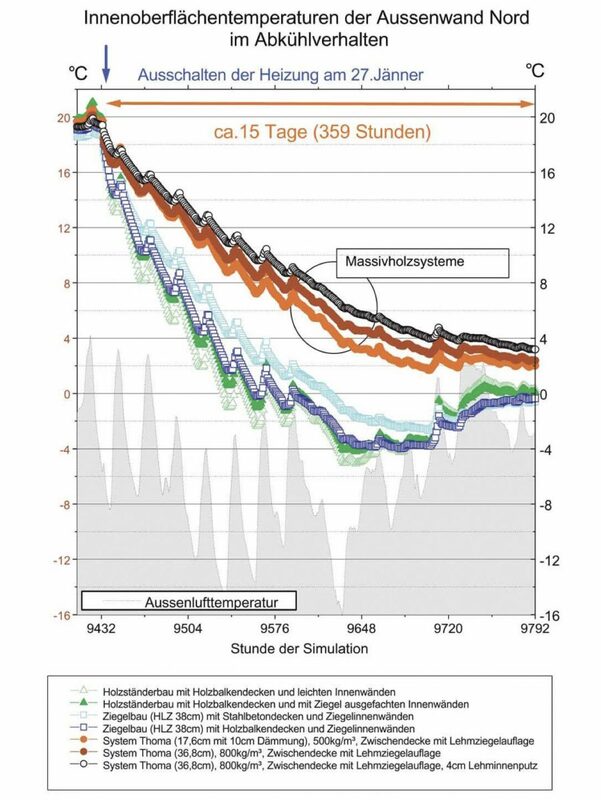 ​The graph shows how the temperature of the inner wall decreases after the heating has been switched off, whereby the overall behavior of the building with windows and doors was measured. The Holz100 house cools much slower than comparable building materials.